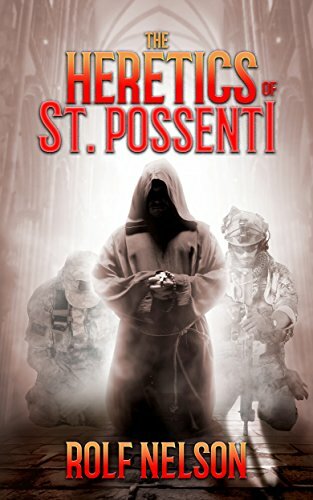 Not what I expected, that was what Rolf Nelson’s The Heretics of St. Possenti was. I figured it for a military sci fi novel, set in a dystopian future. In fact it’s a utopian story of a sort, set in the present or the very near future. By “utopian story” I mean the kind of story that proposes a major societal change and tries to demonstrate how well it will work. The books of this sort I remember best are Edward Bellamy’s Looking Backward, and B. F. Skinner’s Walden Two. I suppose Ayn Rand’s novels are the same sort of thing (quite close to the kind of story this is), but I’ve never read Rand. The Heretics of St. Possenti introduces us to Bishop Thomas Cranberry, who through misadventure spends a night in jail and is then given a leave of absence by his archbishop. Intrigued by the complaints of the men he’d met in jail – who said the Church offered them nothing that was of use here and now – he decides to get to know some of these “marginal” men. In a dojo and in a bar he meets military veterans, many of them suffering from PTSD, who can find no place in the world. They encounter nothing but Catch-22s in the VA, the welfare offices, or drug treatment centers. They can’t get work with a living wage. Many are deeply in debt. With the help of his new friends, Bishop Cranberry begins to formulate a plan to create a new order of warrior monks. These men would have to commit to three years in the monastery, in return for a generous loan to consolidate their debts. They’d submit to monastic discipline and military discipline, and learn marketable skills. Most important, they would learn self-respect and faith. The rest of the story tells how the dream comes to fruition. It’s interesting and even stirring in places. But it didn’t sell me, speaking only for myself. My impression whenever I read such utopian stories is that the authors tend to underestimate the ability of human beings to mess things up, to their own hurt. Many problems crop up in the story, but the infallible system the bishop has created solves each of them pretty easily. One of the weaknesses of stories like this is that large stretches tend to read like panel discussions, and the Good Guys get all the good lines. The prose in general is undistinguished. Well, it’s a story with a plan to sell you; advocates gonna advocate. The narrative promotes conservative Roman Catholicism, gun rights, and border control. I am not hostile to the first, and I’m all for the other two. I was never unaware that someone was trying to sell me something, though. But I never lost interest. The book held me until the end. You may like it quite a lot. I wish the program well; I’d like to see it tried. Cautions for language, but not too bad. The monks have to throw a quarter in a jar whenever they swear.